TNPSC Annual Planner 2018-2019 : Tamil Nadu Public Service Commission (TNPSC) Annual Recruitment Planner 2018 to 2019 PDF format is available. Every Year TN government Release the Annual Plan Calender Chart. For this year TN PSC Various Service Post Vacancies Like TNPSC Group 1, Group 2, 2A, CCSE Group 4, VAO, Group VII-A Jobs to be filled through Combined Civil Serivce Examination.In this Page, you can know the TNPSC Official Notification which consists of Name of the post/Recruitment/Services, Date of Notification and Date of Examination. 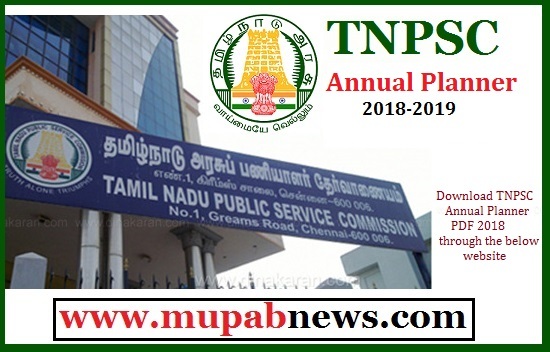 For upcoming TNPSC Exams 2018,2019 and 2020 stay tuned with www.mupabnews.com. Note: TNPSC Annual Planner 2018-2019 which is displayed above may be the date of notification and examination will be differs and it depends on the decision of the commissioner of TNPSC and depends on the vacancy of the respective deparments.